Summer is definitely on its way, and I’ve begun to wistfully turn my eye to winter fashion. Shop mannequins are being draped in gauzy white dresses and the dreaded nautical trend, and all I really want now are some well-cut cigarette pants and a good collection of patterned vests. Pants. Yes. I don’t actually own any. I don’t know where my jeans have gone, either. I spent all of winter bare-legged or in patterned stockings, which was rather fun but I’m in the mood for something different. I’m not sure where I’d get the suits to attempt that androgynous look; I’m a petite kids 12 (AU 6, although that’s near impossible to find in most stores) and there are very few producers of children’s suits. I’m eyeing Ralph Lauren but my budget doesn’t allow it at the moment. Terribly unfair. 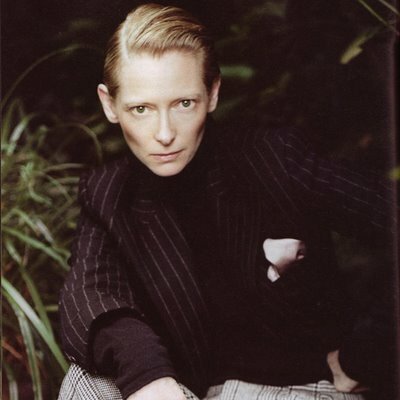 …This post was meant to be about me and suits and now all I can think about is Tilda Swinton and how much she intrigues me, aesthetically. I wouldn’t call her pretty; ‘pretty’ feels tame. Just ‘striking’. Incredibly striking. She’s like an alien, and I mean that in a good way.